Iranian Foreign Minister Javad Zarif today began a regional tour to solicit support for the nuclear deal and Iran’s military interventions in the region. 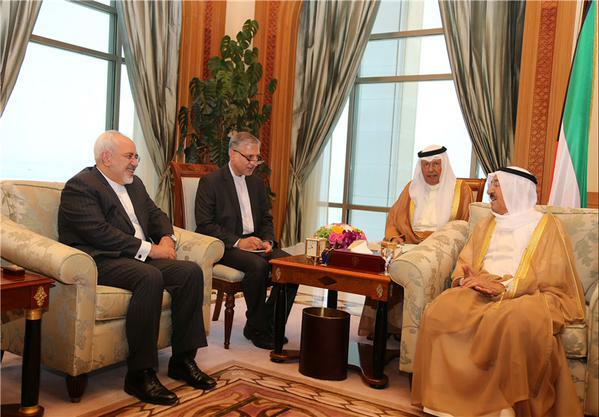 Today, Zarif met Sheikh Sabah, the Emir of Kuwait, and his Kuwaiti counterpart, Sheikh Sabah al-Khaled. Zarif left Kuwait Sunday evening for a visit to Qatar. The three-country tour will also take Zarif to Iraq. UPDATE: Zarif arrived in Najaf, Iraq, in early hours of Monday after visiting Kuwait City and Doha on Sunday. He will conduct a pilgrimage to the Shrine of Imam Ali and will later meet with Grand Ayatollah Sistani, the spiritual leader of the Iraqi Shias, before heading to Baghdad for meetings with senior Iraqi government officials.